PUNE: The Pimpri-Chinchwad Municipal Corporation (PCMC) has given the green signal to the Consulate General of Sweden and the Swedish Chamber of Commerce India to develop a three-kilometres patch of Sveanagar Road in Dapodi into a Smart Street. It will be renamed as Swedish Avenue. The road work will begin very soon and will complete in around 6 months. 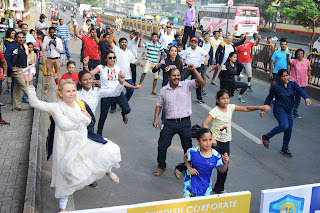 She said the Swedish Avenue in Pune will be a symbol of Swedish values, innovations, sustainability and technology. “The street, which houses three Swedish corporate giants - Sandvik, Atlas Copco and Alfa Laval - will showcase Swedish solutions for beautification and maintenance of streets. The street will have solar power poles, air pollution information, recycling systems and waste management systems, infrastructure made of recycled material, bicycle track, pavements for pedestrians, smart transportation like e-bikes, electronic boards, information signages and others,” Sundberg explained. She said that an array of exhibitions showcasing Swedish art and culture will also be held at Swedish Avenue from time to time. According to her, persons crossing the Sveanagar or Swedish Avenue must feel like they have entered a Swedish part of Pune. Vice President of Swedish Chamber of Commerce India and Managing Director of Sandvik, Parag Satpute, said that the street will be a showcase of Sweden. “The street will showcase Swedish technology and innovations in sustainability. The government and local bodies working on the Smart City project can implement these or similar technologies while developing Smart Cities,” he added. He said that while the plan has only just got approval, discussions will be held with the concerned stakeholders at PCMC for further planning and development.